Anglers fishing near the mouth of the Susquehanna River and nearby tidal rivers have been reporting some success with catching striped bass in about 25 feet to 30 feet of water. Jigging with large soft plastic jigs and trolling have been popular ways to fish. 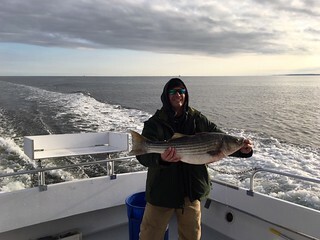 The grade of striped bass has been a pleasant surprise with most fish measuring between 20 inches and 28 inches in length. Further south, trolling has been the most popular way to fish this week. 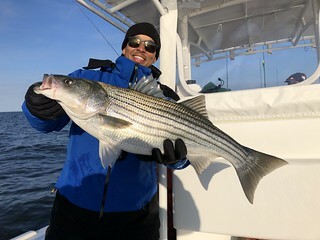 Most are trolling umbrella rigs in chartreuse with heavy inline weights to get them down to depths of 25 feet to 40 feet, where striped bass can be seen suspended off the bottom. Finding the striped bass on depth finders has been the easy part; getting them to bite is another story. As surface water temperatures dip into the 40s this week many striped bass are in the mood to chill out for the rest of the season and are not interested in feeding. 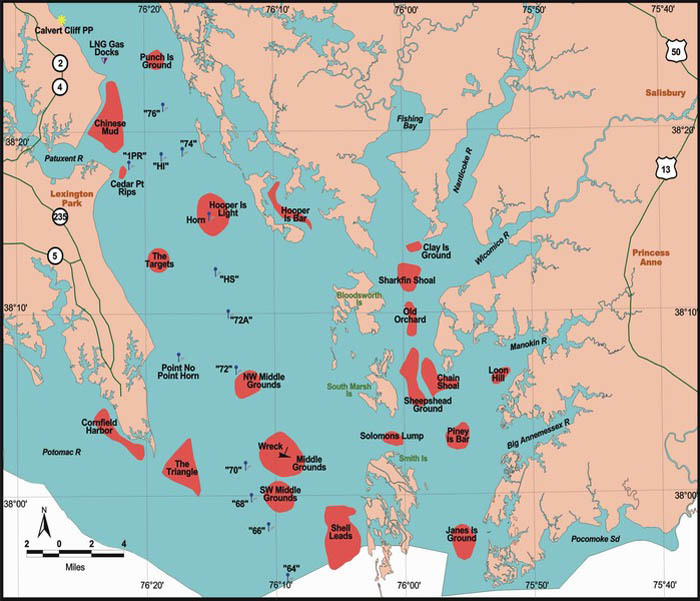 A few popular locations are the mouth of the Patapsco River, Swan, Love and Podickory points. The Bay Bridge deep water bridge piers, concrete abutments and rock piles offer the best place to try jigging. The striped bass are beginning to stack like cord wood, and they will show up quite vividly on a good depth finder. Getting them to bite might take some effort and it is not uncommon to snag a few by accident while jigging. Soft plastic jigs in pearl or chartreuse have been favorites. White perch have moved out into the deeper channel areas in the bay and are hunkered down over hard bottom areas, while some of the larger ones can still be found at the rock piles at the Bay Bridge. Bottom rigs baited with pieces of bloodworms or dropper fly rigs baited with the same will catch them. Yellow perch are moving into the tidal rivers and are providing some fun fishing opportunities. Small minnows on a bottom rig or tiny jigs are a great way to catch them. Channel catfish are holding in every upper bay tidal river and part of the bay itself, and they are eager to sample any cut bait you might give them. The current surface water temperature at the Gooses has now dropped to the upper 40s and will continue to fall as cold weather prevails. Fishing for striped bass is getting tougher since the fish are holding deep, and they are difficult to entice to take a jig or lure being trolled. The edges of the shipping channel offer some of the best locations to look for striped bass that are holding close to the bottom in deep water. There have been some reports of large fall migrant striped bass showing up at deep edge locations such as Bloody Point. so it might pay to place some larger parachutes in your trolling spread. Those jigging are using large soft plastic jigs in chartreuse or pearl colors and working them close to the bottom. The most popular way to troll is to use umbrella rigs in chartreuse with large inline weights to get them down to the fish. White perch offer an opportunity when one can find them schooled up on hard bottom near the mouths of the region’s major tidal rivers. A bottom rig baited with pieces of bloodworm or a dropper fly rig that has pieces of bloodworm for added enticement work well. Channel catfish are active in the tidal rivers and offer some fun fishing. 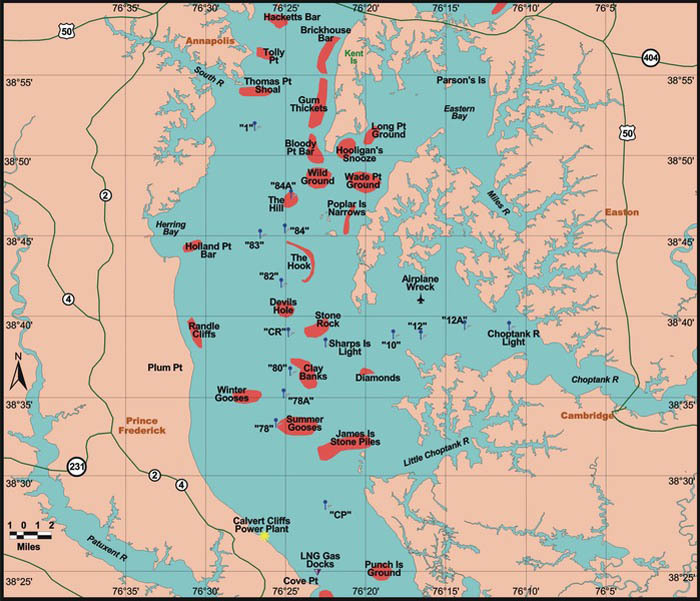 Right now, this region offers some of the best fishing opportunities for striped bass in Maryland. Striped bass are being found along channel edges in 25 feet of water or more. The lower Potomac near St. Georges Island, along with the mouth of the river — an area often referred to as the Triangle — are holding a wonderful grade of legal-sized fish. 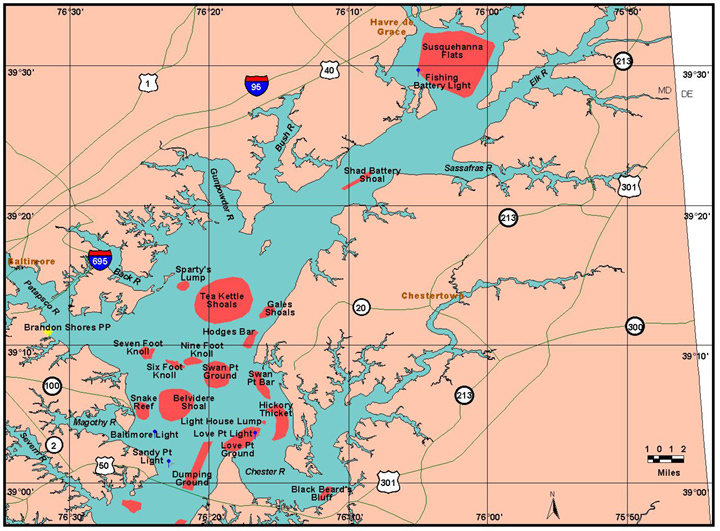 The lower Patuxent River and the eastern side of the shipping channel near Buoys 72 and 72A are also good places to fish. Gannets and sea gulls can often point the way to striped bass and the bait they are pursuing. Trolling with umbrella rigs with bucktails dressed with sassy shads and sent deep with inline weights has been a very popular way to fish, especially for the charter fleet. Chartreuse tends to be a favorite color. Jigging is also popular and offers some great light tackle action on these robust fish. Large soft plastic jigs in the 8-inch or larger sizes tend to attract the attention of the larger fish that are feeding on menhaden. Fishing for white perch is presenting a great opportunity in the deeper portions of the lower Patuxent River and the Nanticoke River. The white perch are now holding in about 35 feet to 40 feet of water over hard bottom. 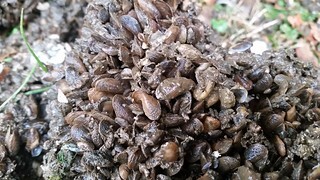 After locating them on a depth finder, using a bottom rig or dropper fly rig tipped with pieces of bloodworm is the best way to catch them. Fishing for blue catfish has also been very good in the middle sections of the Patuxent River and in the Potomac from the Route 301 Bridge north to the Wilson Bridge. Most any kind of cut bait will catch them and because they are so abundant and mild tasting, they make a great addition to one’s freezer. The streams and freshwater portions of rivers in the western and central regions of the state continue to run high due to recent heavy rains. There are still plenty of trout to be found in many of the trout management waters designated as put-and-take. Targeting the upper portions of these waters is often the best option since they recover quickly from rain events. Casting a variety of small spoons and spinners is a good way to fish for them with spinning tackle. The trout management waters that are designated catch-and-release or fly-fishing only offer a wonderful experience for those out to enjoy a day of fishing where keeping the trout is not important. Casting streamer flies or drifting nymphs offers plenty of action. As cold temperatures descend upon Garrett County, anglers in the area are starting to talk about ice fishing at Deep Creek Lake. It will be a while before things freeze up and then there is always a wait for safe ice. Right now there is open water and, if the wind ever calms down, plenty of good fishing. Walleye and yellow perch are active in relatively shallow areas along deep grass lines and steep rocky edges. Drifting live minnows or working a lip-hooked minnow with a small jig along the bottom are often the best ways to catch them. Largemouth bass are moving to deeper waters as water temperatures drop and working jigs or crankbaits near deep sunken wood is a great way to target them. These fish are looking for warmer water and some kind of cover. Now that most grass is gone, sunken wood, fallen tree tops and structure such as bridge piers and rocks offer a place to hunker down. Most of the areas now holding largemouth bass fall into the 10-foot depth range. As water temperatures drop even lower next month, expect them to move into deeper areas. Crappie are schooling up near deep structure such as fallen tree tops, marina docks and bridge piers. They offer some enjoyable fishing this time of the year when fishing minnows or small jigs under a slip bobber. Cold winter waters often mean excellent fishing for chain pickerel. They are common in the upper reaches of the tidal rivers and most reservoirs and lakes, and are always eager to attack anything moving through the water. A wide variety of lures from spinners and spoons to jerkbaits will work well. Unfortunately chain pickerel have a habit of inhaling baits and they often can get treble hooks caught around the gills, so a good set of needle-nosed pliers helps a lot for you and the fish. The smaller chain pickerel, often called “hammer handles,” will be found in ambush positions along shoreline structure. The really large ones often hold in more open waters near deeper structure. Surf casters continue to catch small bluefish on finger mullet rigs or small cut baits. The larger fall run bluefish tend to be sparse this year. 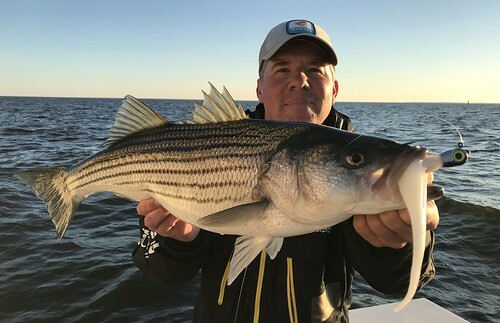 Everyone continues to soak large baits hoping that a few southbound striped bass will move along Maryland’s shores soon. They are coming, currently stretched from Long Island to New Jersey. A few large striped bass are being caught at the mouth of Delaware Bay so there is hope the vanguard of this migration will arrive soon. At the inlet and Route 50 Bridge area, small bluefish are being caught in the evenings by casting lures or drifting cut bait. Tautog are in residence along the jetties and bulkheads and are being caught on pieces of green crab or sand fleas. Most are a little short of the 16-inch minimum but there is plenty of action. At the inlet and Route 90 Bridge area, striped bass are entertaining light tackle fishermen casting a variety of bucktails and swimshads. A lot of throwbacks are the norm but some nice ones over 28 inches are being caught. The boats headed out to the offshore wreck and reef sites are finding limits of sea bass for their customers with a mix of bluefish, large flounder and a few triggerfish. Reports of spiny dogfish are becoming more common. 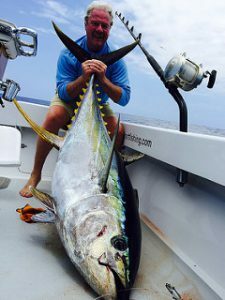 There are still some large yellowfin tuna being caught at the canyons when warmer water can be found. There has also been some exciting catches of swordfish and bigeye tuna at the Baltimore Canyon.